Powers/Abilities: The Braineaters had the conventional powers of werewolves including enhanced human strength, speed, agility, endurance, resistance to injury (except silver and wolfsbane), razor sharp claws and teeth, enhanced senses (esp. hearing, night vision, and olfactory), etc. In addition, they had completely accepted their dual natures, and could change back and forth to human at will, regardless of the presence of the moon. Almost all of them rode motorcycles, traveling the country, feeding on people for pleasure and nourishment. (Werewolf by Night I#6) - At the Lame Duck Inn, a group of truckers mistook the Werewolf--in the dark of night--for the person who had been "messing with their rigs." They ambushed the Werewolf and, though they held their own for a short time, were received several scratches before catching the Werewolf's face in the light and promptly fleeing. (Marvel Comics Presents I#57/2 (fb)) - A gang or group of people in Los Angeles challenged the Werewolf under the light of the full moon. He ripped through them like a hot knife. 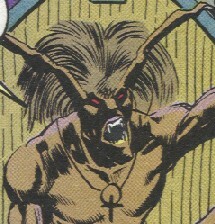 ((Marvel Comics Presents I#57/2 - BTS) - Those who had been scratched or bitten by a werewolf inherited the curse of lycanthropy. A number of werewolves joined together to form a group known as the Braineaters. (Marvel Comics Presents I#54/2 - BTS) - In Los Angeles, Silver Dagger investigated the scene of a slaughter perpetrated by a traveling sect of the Braineaters, killing the survivors to prevent them from becoming werewolves as well. (Marvel Comics Presents I#55/2) - Layla slew Zandor, an associate of Jack Russell, who had revealed his location to Silver Dagger under duress. (Marvel Comics Presents I#56/2) - The Braineaters confronted the Werewolf/Russell, who had narrowly escaped death at the hands of Silver Dagger. (Marvel Comics Presents I#57/2) - Layla and the Braineaters took Russell with them, teaching him to enjoy the more wild side of life. Russell nearly fell under the spell of Layla, the alpha female, but came to his senses when he saw the rest of the group tearing into the audience at a drive-in movie theater. Infuriated, Russell transformed into the Werewolf and attacked them. The Braineaters fought back savagely until a cigarette dropped by one of them fell onto a gasoline or oil leak from a car, causing an explosion. Wounded, Russell fled, and Layla regrouped the Braineaters and vowed vengeance on Russell. (Marvel Comics Presents I#58/2) - Russell accepted his werewolf nature, increasing in power and healing his wounds, just in time for the Braineaters to catch up with him. Russell and Layla fought fiercely, but the battle was interrupted when Silver Dagger and his Sword of the Lord arrived and began firing silver bullets into the crowd of Braineaters. (Marvel Comics Presents I#59/2) - The Braineaters and the Sword of the Lord slew each other to the man in a bloody battle. Layla's death inspired Russell to take out the last of the Sword, and then Silver Dagger as well. (Marvel Comics Presents I#109 (fb) - BTS) - A second pack of Braineaters was on a cross-country killing spree. (Marvel Comics Presents I#107) - Ghost Rider/Ketch found a recent victim of this other pack of Braineaters in New York. The same group later drove off a mugger, only to take his would-be victims for themselves. They brought their victims into Central Park for a ritual slaughter, where they were observed by three youths, including Billy Baldwin. The werewolves picked up the scent of their observers, and captured and slew two of them, though Billy Baldwin fled. One of their victims was discovered by the Werewolf (Russell), who had been tracking this second pack across country. Russell was mistaken for the killer and attacked by Ghost Rider (Ketch). (Marvel Comics Presents I#108) - The Braineaters somehow tracked down Baldwin's apartment and tortured and killed his father, mother, and sister in an effort to find him, though neither one knew where he was. Lupe approached their leader Scuzz for a little...distraction...but he slapped her aside, telling her there would be no partying until they found the boy. (Marvel Comics Presents I#109) - The Braineaters caught up with Billy Baldwin on the streets of New York. However, Ghost Rider and Russell (who had resolved the clich�d mistaken identities/motives fight) caught up with them as well, and fought the Braineaters back. Scuzz through a pole through the spokes of Russell's motorcycle, knocking him off of the bridge. Scuzz then managed to grab Billy and threatened to rip him to pieces if Ghost Rider didn't surrender. (Marvel Comics Presents I#110) - The Braineaters tied each of Ghost Rider's limbs to their cycles and tear him apart, but the chains gave before he did. Scuzz wanted to kill Billy, but Lupe convinced him to keep Billy hostage in case Russell or others came after them. Ghost Rider was weakened by their assault and was unable to pursue them. Ghost Rider and Russell regrouped and Russell sent Ketch to try to catch the Braineaters unawares in human form, to find Billy. Ketch followed leads to the Black Moon Bar & Grill where the Braineaters were partying hearty. Scuzz found Ketch's scent to be vaguely familiar, and sent Lupe to check him out. Ketch made a connection with Lupe and convinced her that she had the potential to be better. However, Scuzz then broke them up, and sent Cody and Razorblade to take Ketch outside and beat him. They left him to bleed to death. (Marvel Comics Presents I#111) - Russell found Ketch and took him into a sewer to hide his scent, and then treated his wounds for 24 hours until he recovered. Meanwhile, Scuzz began to think that Billy was no longer needed and wanted to change him from figurative to literal dead weight. Lupe took Ketch's words to heart, distracted and then punched out Razorblade, threw him into the drinks of some of the others--causing a great fight, and fled with Billy. Scuzz quickly realized what had happened and led a pack of Braineaters after them. Lupe sacrificed herself to give Billy time to run, and Scuzz killed her himself. Ghost Rider and Russell arrived then, and Ghost Rider tackled Scuzz, who told him that if he took the time to fight him, his Braineaters will have slain Billy before he could reach them. (Marvel Comics Presents I#112) - Ghost Rider let Scuzz go and joined Russell in trying to save Billy. Russell packed Ghost Rider's chain with silver bullets, and then Ghost Rider fired them at the Braineaters, who were all in human form. The Braineaters survived, but learned that they would die if they turned into werewolves again, as this happened to one of their number (Razorblade?). Ghost Rider went after and subdued Scuzz, who tore himself from his grasp, deliberately falling and impaling himself on a spiked fence below. Comments: Created by Len Kaminiski and Jim Fry. MCP#57/2 referenced Werewolf by Night I#6 as the attack that transformed them into werewolves. That issue featured two struggles, one involving a group of truckers who mistook the werewolf for the person who had been sabotaging their rugs, and one involving Swami Rihva and Calliope's Carnival and Circus. 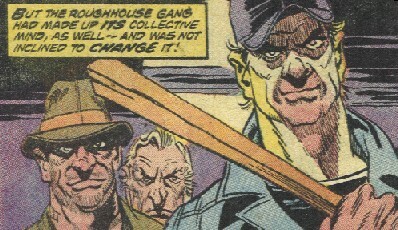 The Hellrunners cycle gang from Marvel Spotlight I#3 would have been a better group to reference as the original Braineaters. The events of the flashback in MCP#57/2 took place two years Marvel time before the series in MCP#54-59. 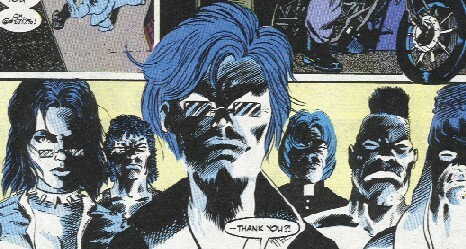 The African-American, long-haired member of the Braineaters was referred to as Cody by another member in MCP#110, and Lupe mentioned Razorblade in reference to someone who looked different. 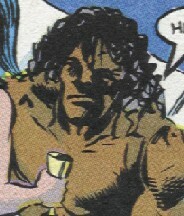 However, in MCP#111, Lupe clearly called the African-American, long-haired member Razorblade. So, either he was Razorblade and his real name was Cody, or the word balloon was pointing to the wrong person in MCP#110, and the white guy with the mohawk was Cody, or the African-American was Cody (and Lupe called him the wrong name due to nervousness, and he didn't pick up on this as she was acting hot and heavy for him) and the white guy was Razorblade. At any rate, it looked like one of those two was the one to challenge the threat of the silver bullets, and exploded upon turning back into a werewolf. A surgeon could remove the bullets from the Braineaters, allowing them to return to action. Also, the regular metal of a fence shouldn't have killed Scuzz. Lastly, I'd bet little Billy picked up at least one small scratch during his multiple contacts with the Braineaters. He'd make a good member of the Legion of the Night. 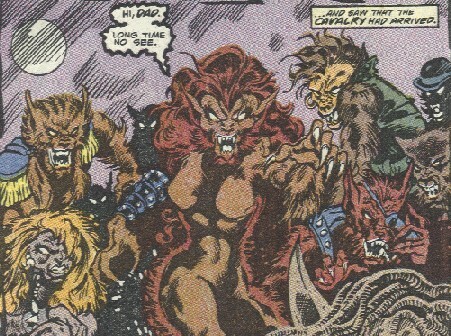 Layla's last name was revealed in the Werewolves profile in OHotMU A-Z HC#13. LUPAN race (CR^EEE + family)  extra-terrestrial, small furry mammals. two have been companion to the Saurid Ch'od. actor Billy Baldwin, brother of Alec and Stephan. A member of Scuzz's pack. He was one of the two that beat Dan Ketch nearly to death, and he later was presumably was impregnated with silver bullets by Ghost Rider, preventing him from transforming into a werewolf, at the risk of death. She was the leader of the pack that fought Werewolf and Silver Dagger. As the alpha female, she possessed a charisma and scent that entranced other werewolves, causing them to love and obey her. She killed Zandor and then tried to seduce Russell into joining her pack. When he fought against them, she led the Braineaters in a search for vengeance. She fought Russell one-on-one, nearly driving him into a murderous rage. However, she was instead killed by silver bullets fired by a member of the Sword of the Lord. Part of the pack led by Scuzz, she was also his lover, though she had been known to be...distracted by other members of the pack. Unlike the rest of the Braineaters, Lupe was primarily with the group for pleasure, and was not a bloodthirsty killer. She managed to convince Scuzz not to kill Billy Baldwin, and after being inspired by Dan Ketch, she helped Billy escape. She sacrificed herself to delay the Braineaters, and Scuzz savagely slew her. She lived long enough to be found by Ketch, who praised her for her efforts. Leader of the pack that fought Ghost Rider and the Werewolf. He was both shrewd and bloodthirsty, though he did allow his lover Lupe to convince him to delay the death of Billy Baldwin. 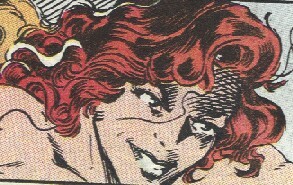 He ultimately killed her when she enabled Billy to escape, and he later chose death over capture or infiltration with silver at the hands of Ghost Rider. A ten year old boy, he and his two friends saw the New York Braineaters slaughter a couple in Central Park. The Braineaters killed his friends, but Billy fled to safety. The Braineaters found his apartment and killed his sister, Lucy, and his parents. They then tracked him down on the streets of New York, and though Ghost Rider and the Werewolf tried to stop them, they managed to capture him anyway. 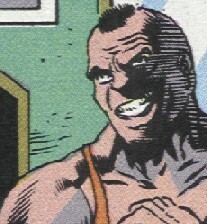 Only the intervention of Lupe prevented Billy from being killed on the spot, so that he could be used as a hostage in case the heroes returned. Lupe later enabled him to escape, at the cost of her own life, and Ghost Rider and Ketch stopped the Braineaters for good. Billy went to live with other relatives.